Syriac and Latin. Psalms). Psalmi Davidis. Edited by Thomas Erpenius. Latin and Syriac in parallel columns. Wide margins. Printer’s palm-tree device on title and final page. Learned marginalia. pp. (8), 346, (1), (1 blank). Lightly browned. Contemporary vellum, stained. 4to. 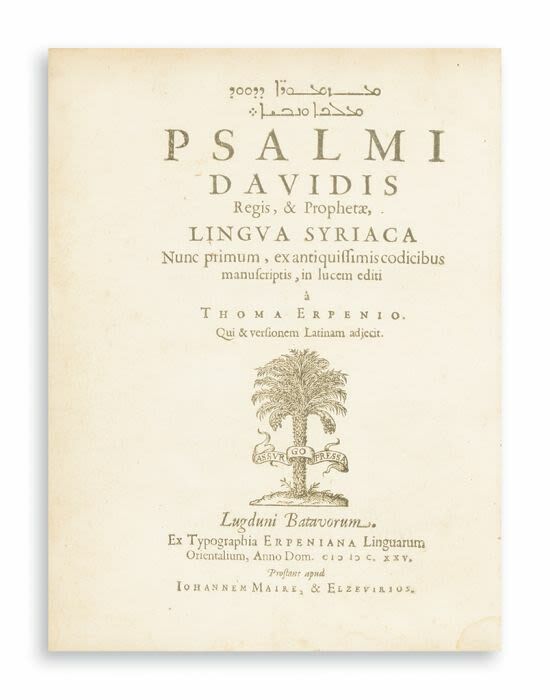 “The first European edition of the Psalter in Syriac.” Darlow & Moule 8960.